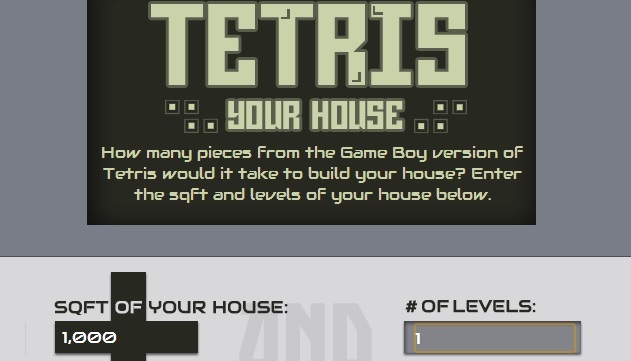 To answer to the question: “How many Tetris pieces would it take to build a house?” the design team over at Movoto assumed two things: One, the Tetris pieces in question would be the same size as the ones that appear on the original Game Boy screen. And two, there would need to be a one-block gap in every layer of the house to ensure it doesn’t disappear row-by-row like it does in the game. With those parameters in mind, a complicated equation was cooked up — one that even accounts for window and door gaps. “Knowing how many pieces comprised our standard “building block,” we determined how many of those were required to construct the walls and roof [of a two-storey, 2,500-square-foot home]. The result: a whopping 1.3 billion Tetris pieces,” Movoto explains on their website.